Bastion-P, labelled the SS-C-5 Stooge in NATO reporting, is a mobile system with cruise missiles loaded on to launch trucks and controlled from command and support vehicles, making it easier to move and to hide. The supersonic P-800 Yakhont (Gem) is a ramjet version of P-80 Zubr [SS-N-7 Starbright]. The Yakhont missile has a range of 300 kilometers, the capacity to carry a 200-kilogram warhead and the unique ability of being able to cruise several meters above the water surface, making it difficult to detect and intercept. The ship, submarine and coastal-launched Yakhont is launched from the unified ampoule-shaped transport-launching container (TLC). The container is 9 m long, is 0.71 m in diameter. The firing range reaches 300 km (162 nmi.) when flying along a combined trajectory and 120 kg (265 lb.) when following only a low-altitude trajectory. Flight speed varying over the range from M=2.0 to M=2.5 is provided by the kerosene-fueled multi-mode liquid-fuel ramjet. The P-800 Bolid is the encapsulated, submarine launched version of Yakhont. 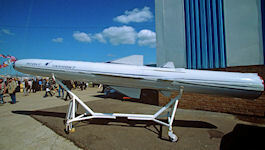 An air-launched version of the missile with the take-off weight of 2,500 kg (5,507 lb.) was also developed. The closest American counterparts, the Tomahawk and Harpoon missiles, are subsonic; the best French antiship missile, the Exocet, has a range of only 45 miles. The homing head is designed for search and detection of sea-borne and land-based targets in electronic countermeasures environments, for selection of false targets based on data supplied, for acquiring and tracking of a chosen target, and for preparation and presentation of target coordinates to the onboard autopilot system of the Yakhont anti-ship cruise missile. The homing head performs the above functions in severe weather in conditions up to Sea State 7. The homing head is an onboard two-channel active/passive radar with a complex wide-band coherent signal with a phase-code manipulation in compliance with the random law both during surveillance and tracking in an active operation mode. The homing head re-adjusts frequencies and time parameters. It is highly immune to various active countermeasures that affect the operating range and angle coordinates. Also, it is resistant to passive interference like dipole clouds and angular reflectors. It adapts to unfriendly environment and difficult operating conditions. The homing head is modular: antenna, transmitter, receiver, information processor, built-in self-check device. It employs the latest achievements of Granit-Electron and other defense companies of Russia. In Russia, by 2016 the Bastion-P was deployed near Sevastopol, Anapa, the Kola Peninsula, Novaya Zemlya and the Kurile Islands. There is reason to believe that in the near future these systems will deploy for combat duty near Kaliningrad and in Kamchatka. Additionally, plans exist to deploy the first 'Bastion-S', a silo-based system with up to 36 anti-ship cruise missiles, in Crimea by 2020. A Bastion-P battery contains up to four launch trucks with two missiles each, a matching number of reloading trucks with three missiles each, and one or two command post vehicles equipped with a target acquisition radar. A missile battalion consists of two batteries. The Russian-Indian joint venture BrahMos Aerospace Ltd, was set up in 1998 to manufacture supersonic cruise missiles based on the Russian-designed NPO Mashinostroyenie 3M55 Yakhont (SS-N-26). Sea- and ground-launched versions have been successfully tested and put into service with the Indian Army and Navy. Indian ground forces successfully test-fired a BrahMos supersonic cruise missile in August 2011, the 25th Brahmos launch for the Indian Army. The test met all the mission parameters. Indonesia bought an undisclosed number of Russian SS-N-26 Yakhont supersonic anti-ship cruise missiles for $1.2-million apiece in 2007 to replace Harpoon missiles on its frigates. In October 2008, Indonesia Navy Commander Adm. Tedjo Edhy Purdijatno said his country would like to buy Russian SS-NX-26 Yakhont supersonic anti-ship cruise missiles. On 21 April 2011 the Indonesian Navy has successfully tested a Russian-made anti-ship missile for the first time. The Yakhont anti-ship missile was launched from the Van Speijk class frigate, Oswald Siahaan, during naval exercises in the Indian Ocean. Russian observers oversaw the drills, which involved 12 ships and over 1,000 personnel.